This page describes how to create notifications for a watch. 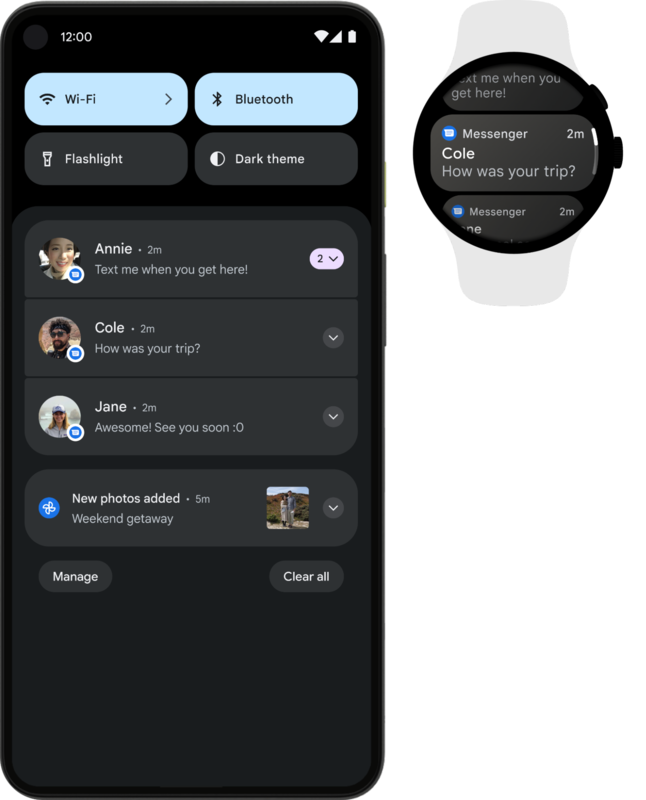 This page also describes how to provide additional content for each notification that is bridged to the watch from a connected phone. Notifications on watches have the same structure as notifications on phones. Additionally, to give users the best experience, Wear OS by Google provides APIs for adding wearable-specific features to notifications. When you issue a notification from your app, each notification appears as a card on the Notification Stream. Figure 1. The same notification displayed on a phone and on a watch. Both the watch and the phone can be sources of notifications. 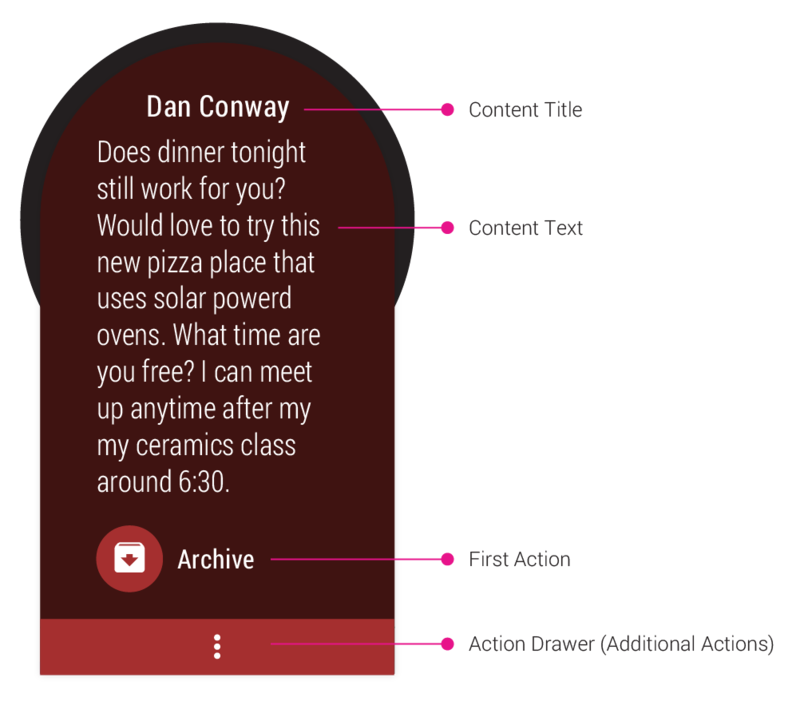 Use the NotificationCompat.Builder class to create notifications for wearables. When you build notifications with this class, the system takes care of displaying notifications properly. Note: Notifications using RemoteViews are stripped of custom layouts and the wearable only displays the text and icons. However, you can create custom notifications that use custom card layouts by creating a wearable app that runs on the watch. The v4 support library allows you to create notifications using the latest notification features such as action buttons and icons, while remaining compatible with Android 1.6 (API level 4) and higher. Note: Starting in Android 8.0 (API level 26), you need to create notification channels for each type of notification you want to display. Create an instance of NotificationCompat.Builder. // The channel ID of the notification. // (API level 25) and lower. Issue the notification by passing the Notification object with a notification ID to notify(). // Issue the notification with notification manager. When this notification appears on a phone, the user can invoke the PendingIntent specified by the setContentIntent() method by touching the notification. When this notification appears on a wearable, it appears in the notification stream. For bridged notifications, the user can click the notification to view the expanded notification and trigger any defined action, such as open action. Usually, these actions opens an Activity on your phone app. Expanded notifications provide substantial additional content and actions for each notification. When you specify additional content pages and actions for a notification, those are available to the user within the expanded notification. 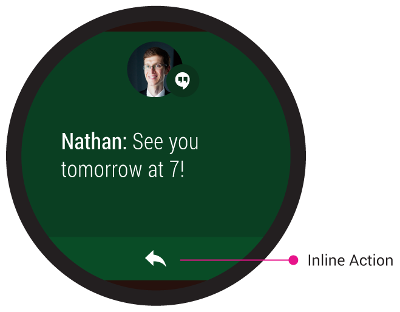 Each expanded notification follows Material Design for Wear OS, so the user gets an app-like experience. If the first action in the expanded notification has a RemoteInput (for example, a Reply action), then the choices you set with setChoices() appear within the expanded notification below the first action. The notification is generated by an app on the paired phone and bridged to Wear. The notification does not have a contentIntent. Note: An app-specific background color set for a notification with the setColor() method is shown only when you expand the notification. All notifications bridged from the paired phone to the Wear device will use expanded notifications. If a notification is generated by an app running locally on Wear, you should make the touch target of your notification launch Notification object with a notification ID within your app by calling setContentIntent(). We recommend that you do not use expanded notifications for notifications generated by an app running locally on Wear. Expanded Notifications allow you to include additional content and actions for a notification. You choose the level of detail that your app's notifications will provide; however, be judicious with the amount of detail you include in a notification. To show additional text in your expanded notification, use the BigTextStyle. To add images in your expanded notification, you can use the BigPictureStyle. If you want to add more than one image in your expanded notification, use the addPage() method along with the BigPictureStyle. The expanded notification will contain one primary action, which is the first action in the notification unless a different action is specified using setContentAction(). To specify additional actions, use addAction() or addActions(). The action drawer of the expanded notification contains all available actions. In addition to the primary content action defined by setContentIntent(), you can add other actions by passing a PendingIntent to the addAction() method. For example, the following code shows the same type of notification from above, but adds an action to view the event location on a map. On a phone, the action appears as an additional button attached to the notification. On a wearable, the action appears in the expanded notification after the content text. When the user taps the action, the associated intent is invoked on the phone. Tip: If your notifications include a "Reply" action (such as for a messaging app), you can enhance the behavior by enabling voice input replies directly from the wearable. For more information, read Adding Voice Input as a notification action. Inline action allows users to take actions on a notification from within the notification stream card. On Wear, the inline action appears as an additional button displayed at the bottom of the notification. Inline actions are optional but recommended for cases in which users are likely to take an action on a notification after viewing the contents in the notification stream card (without going to the expanded notification). Examples of good use cases for inline action on a notification include: replying to a text message, stopping a fitness activity, and archiving an email message. A notification can provide only one inline action. To display the inline action as an additional button in the notification, set the setHintDisplayActionInline() method to true. When a user taps the inline action, the system invokes the intent that you specified in the notification action. The following code snippet adds a hint to display an action inline, and uses the addAction method to add the inline action to a notification. //Wear OS requires a hint to display the reply action inline. Create an instance of a WearableExtender, setting the wearable-specific options for the notication. Create an instance of NotificationCompat.Builder, setting the desired properties for your notification as described earlier in this lesson. Call extend() on the notification and pass in the WearableExtender. This applies the wearable options to the notification. Call build() to build the notification. Note: If you use the framework's NotificationManager, some features from NotificationCompat.WearableExtender do not work, so make sure to use NotificationCompat. You can sync dismissals (cancellations) of notifications across the user's devices. To enable a dismissal to be synced, use the setDismissalId() method. For each notification, pass a globally unique ID, as a string, when you call the setDismissalId() method. When the notification is dismissed, all other notifications with the same dismissal ID are dismissed on the watch(es) and on the companion phone. To retrieve a dismissal ID, use getDismissalId(). Note: The setBackground() method is not supported on Wear 2.0. You can use NotificationCompat.BigPictureStyle for notifications that include images. The setHintHideIcon() method is also not supported on Wear 2.0. If you want the actions available on the wearable to be different from those on the phone, then use WearableExtender.addAction(). Once you add an action with this method, the wearable does not display any other actions added with NotificationCompat.Builder.addAction(). The actions added with WearableExtender.addAction() appear only on the wearable and they do not appear on the phone. Voice actions are an important part of the wearable experience. To create an action that supports voice input, create an instance of RemoteInput.Builder that you can add to your notification action. This class's constructor accepts a string that the system uses as the key for the voice input, which you'll later use to retrieve the text of the input in your phone app. const val EXTRA_VOICE_REPLY = "extra_voice_reply"
In addition to allowing voice input, you can provide up to five text responses that the user can select for quick replies. Call setChoices() and pass it a string array. To receive the user's transcribed message in the activity you declared in the reply action's intent, call getResultsFromIntent(), passing in the "Reply" action's intent. This method returns a Bundle that contains the text response. You can then query the Bundle to obtain the response. Note: Do not use Intent.getExtras() to obtain the voice result, because the voice input is stored as ClipData. The getResultsFromIntent() method provides a convenient way to receive a character sequence without having to process the ClipData yourself. * get the associated voice input string. Creating notifications from a standalone watch app is no different from creating bridged notifications. Notifications sourced from a standalone Wear app look similar to bridged notifications but they behave slightly differently. If no contentIntent is set or if the notification is bridged from a paired phone, then tapping the notification opens an expanded notification. Whereas, if the notification is originating from a standalone watch app, then tapping the notification fires the contentIntent to open your Wear app. To learn how to create notifications from a standalone app and mimic the expanded notification behavior, see the Wear Notifications sample. By default, notifications are bridged from an app on a companion phone to the paired watch. If you build a standalone watch app and you have a companion phone app, the apps may create duplicate notifications. For information on handling the problem of duplicate notifications, see Bridging Mode for Notifications.